I know, this was supposed to be posted up on October 5.. BUT.. For some reason I had October 8 in my mind for the next post.. 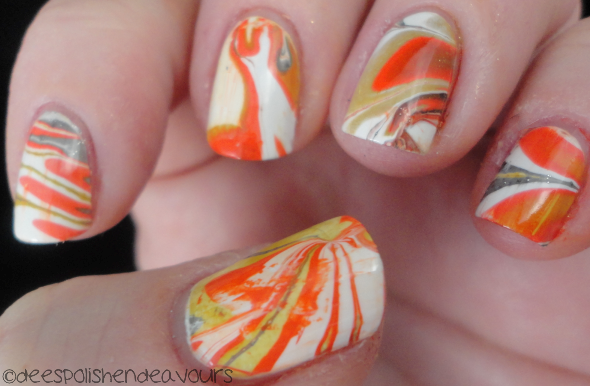 Which is technically a post date.. but it would be for the third part of the challenge.. not the second part..
Or maybe because it is the ever elusive (to me) watermarble. This is a technique I cannot grasp to save my life. My go with it here is no different. It is still awful. I'm sorry!! It is the thought that counts.. right?! I based my nails with Orly White Out. 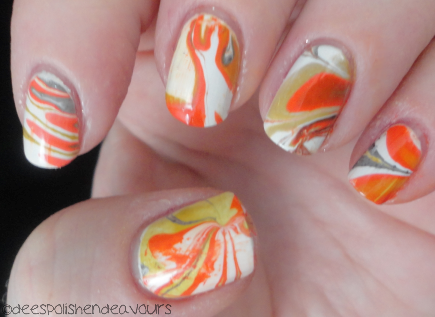 Then I used China Glaze Trendsetter, China Glaze Haunting, Essie Orange, It's Obvious!, and Orly White Out again.